The first production batch of resin SR.53 kits in 1/72nd scale have arrived from Hong Kong and we are very pleased to have these on sale at Scale Modelworld. The kit consists of injected resin parts with minimal pour points, clear cast canopy and high quality silk screen decals for prototype XD145. This is the most accurate kit of the SR.53 produced to date, based on Barry Hygate's excellent drawings along with close up photographs of the surviving airframe in the RAF Museum at Cosford. Also ready for 12th November release is a new Blue Max item, a resin cast conversion set in 1/48th scale for the Sopwith 'Comic' Camel Night Fighter. Designed for use with the Eduard Camel kit, this set includes a complete new fuselage and upper decking, twin Lewis guns, navigation lights and Holt flares all finely cast in resin. 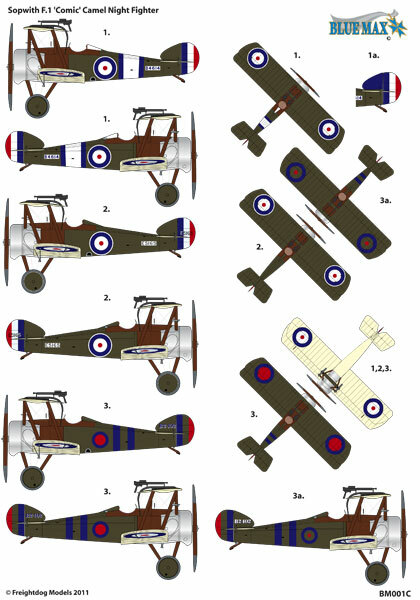 Also included are decals by Fantasy Printshop for two RFC aircraft operating from Hainault Farm in Essex during 1918 (one of which claimed destruction of a Gotha bomber), and an AFC trainer based at Leighterton. The 'Comic' conversion involved moving the cockpit further back and mounting the Lewis guns above the wings, therefore removing the Camels 'hump' and giving it quite a different look. There will be several new resin sets also available in 1/72nd scale, including a Spirfire PR.XI conversion with Post-War Danish decals and a multi-media conversion to produce a Grumman Avenger ECM.6 in Fleet Air Arm service. The Avenger set features grey and clear resin, photo-etched parts and decals. This will be the first of a series of sets covering the type in Post-War service. Next one out in December will be the Avenger AEW in cooperation High Planes, featuring their injection moulded parts with new decals and etch added. Lastly there is a 1/72nd scale Counter-Factual Hawker P.1130 conversion set. Sounds exciting but what is it? Well the P.1130 was an RAF All-Weather Fighter proposal based on the Hunter T.7 airframe from a May 1958 Brochure. The proposal includes the fitting of an AI.18 radar nose along with twin Aden cannon and Firestreak missiles, powered by an Avon Mk.203 engine. Rather than duel control the cockpit features a radar operators position, for this we have included a new instrument panel with scope on the right hand side. We have also taken the opportunity to correct a couple of issues in the kit, namely providing a pair of MB Mk.4 seats, new main wheels and a new nose wheel and leg to replace the undersize items in the kit. Now I will not deny the Xtrakit T.7 is challenging in places, but many will have already invested in one and are wondering what to do with it. 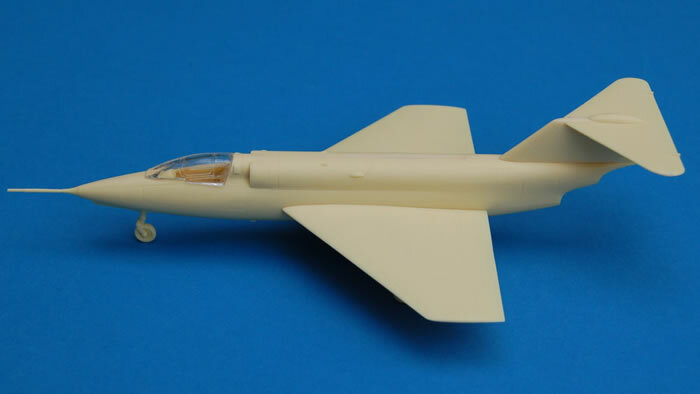 In total you get a new resin nose including the wheel bay, two seats, instrument panel, two Firestreaks, four pylons (two for using the kit drop tanks in the outer position), main wheels and nose wheel with leg. If you are able to attend the show please come and have a look at our stand, we also hope to have several mock-ups of some 2012 releases on display. With 2012 also marking Thirty Years of Pegasus Models there are some exciting plans for next year, starting with the re-release of the Pegasus lozenge decal range in 1/72nd and 1/48th scale.